Ms. Andrechak said on the first day she told her students she was a pretty relaxed teacher, but the one thing she would not tolerate would be bullying and put-downs. There’s always that one teacher that makes a huge impact on a student’s life. For fifth-grade teacher Rachel Andrechak, she didn’t know it would be her just a week into her first year of teaching. During a writing prompt exercise, Ms. Andrechak asked her students what they were thankful for during the first day of school in Kelso, Washington. 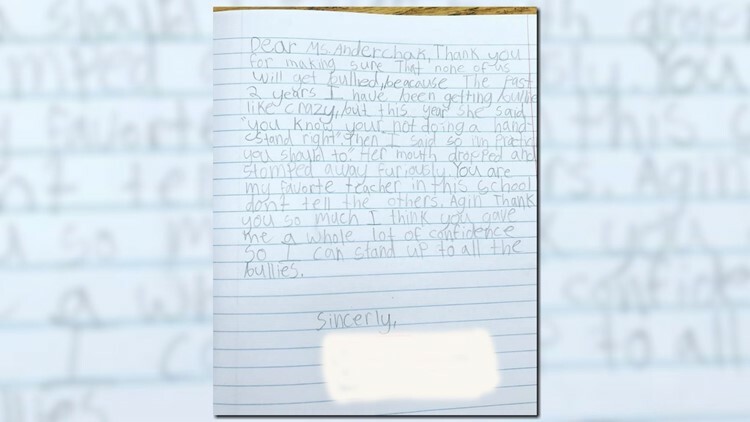 One of her fifth graders wrote a heartfelt note about how the teacher had given her the courage to stand up to a girl she said was bullying her. The note thanked Ms. Andrechak for making sure none of them would get bullied. The girl wrote that she had been bullied “like crazy” for the past two years. She wrote to Ms. Andrechak about a situation where she thought the other girl wasn’t being very nice and she stood up for herself. “I told them, ‘We don’t put people down,’” Andrechak said. Her student went on to write in the note that Ms. Andrechak was her favorite teacher in the school and thanked her for giving her “a whole lot of confidence” to stand up to all the bullies. Ms. Andrechak said she was really proud of herself for making such an impact. “It’s my first year teaching, and they’re fifth-graders. I thought I wouldn’t have an impact because they had already had so many years of school behind them,” she said. Ms. Andrechak said it made her happy because when she was in school bullying wasn’t really talked about and now teachers are making it a priority.